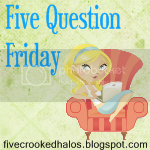 Welcome to Five Question Friday! The easiest, most fun blog hop around! Mama M is the sponsor for this blog hop...and she is kooky and fun...so I am sure you will like her! Rules for Five Question Friday: Copy and paste the following questions to your blog post, answer them, then watch for the linky to appear Friday morning! 1. Where did you meet your spouse, and did you instantly know it was love? Well I met my hubby on a blind date. There was a pool party/barbeque at my sister and brother-in-law's condo, and her neighbor invited them, and she asked my sister if she would also invite me to be a date for her cousin John. I went...we hit it off...we dated every weekend after that...and eventually we got married, a little over a year later. No it wasn't love at first...I think I would call it "hope" that it might be love one day...because he was such a nice guy. That is a hard question because I love our house, and I like most every room. But if I have to pick I will say the living room...which is wide open to the dining room and the kitchen! I love the faux stone fireplace, and built in shelves, and the arches, and the windows...I just LOVE it! I go to bed earlier than my hubby, so after I am done watching tv and being on the computer in my front office/guest room, I get ready for bed, heat up my "wheat~ heat~ bed~ buddy" in the microwave to warm up my bed,(in the cold months), get in bed read a little, then turn off the light, and turn on the tv and fall asleep....usually while praying. If I have the noise of the tv I don't wake up when my husband finally comes to bed...otherwise he comes in and starts snoring and if I wake up I can't go back to sleep. I like 7 or 8 hours of sleep, and function ok if I get that...but not so good if I get less. These are always so fun to read! I can't wiggle my ears either, but sure wish I could. Your love story with your husband inspires me to have HOPE for my daughter who is presently single after going through an unwanted divorce. I love hearing a good love story. God is good and I am so happy that you are happily married to a very nice man. God bless and may you have a super week-end. Hope you are feeling lots better! Hi, Linda! Your answers are so cute. I love this particular theme. Hope you are well. God bless you. Enjoyed your answers Linda! It's the reverse at our house - hubby is in bed by 9 and I go around 11:00. Each to his own, right!! I enjoyed reading about how you and your hubby met on a blind date. So cute! I also love your blog. New follower! Five Question Friday/ Join in the fun!